This Peanut Butter & Jelly Banana Bread will remind you of a PB&J sandwich, but in soft & sweet banana bread form. 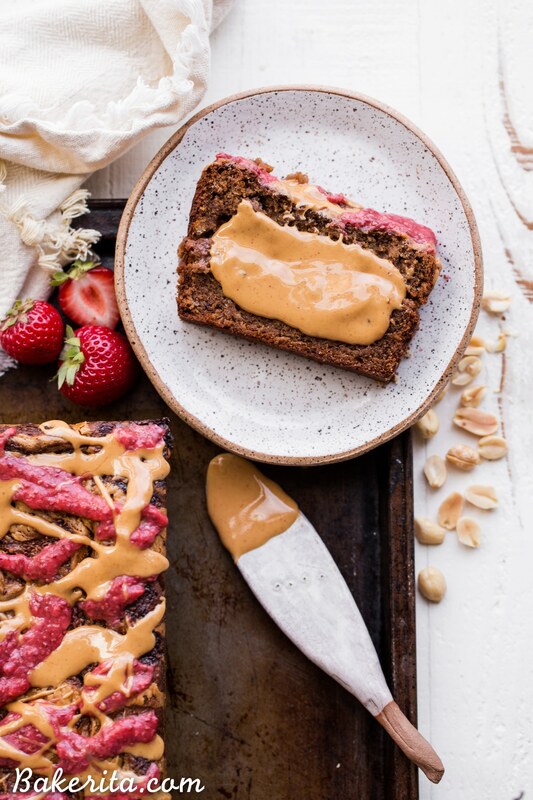 This recipe is gluten-free, vegan, and layered with homemade strawberry chia jam and creamy peanut butter. Alright, it’s October, I should be making pumpkin everything…but I needed to share ONE more non-fall recipe with you first. Pumpkin and all things cinnamon and spice will be coming SOON, I promise. But first: PB&J. Because let’s be honest: who doesn’t love a peanut butter and jelly? 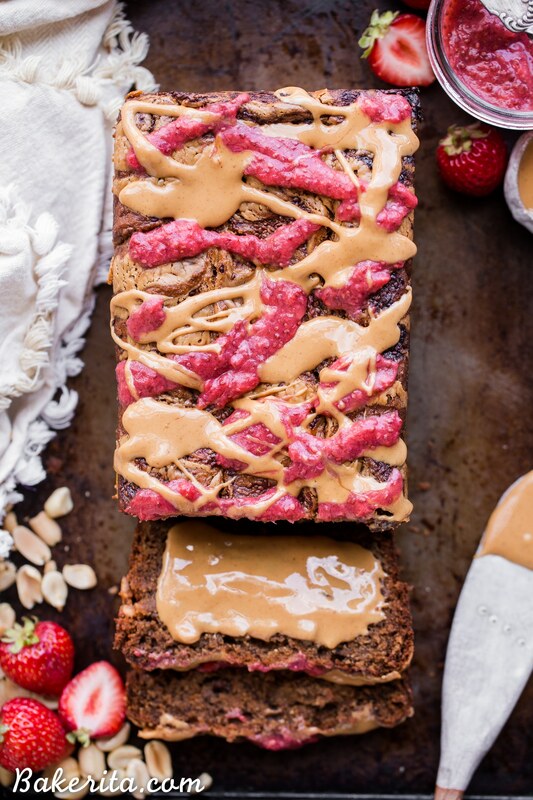 It’s an even better flavor combination when it becomes a peanut butter & jelly banana bread, able to be slathered with even MORE peanut butter and jam. Peanut butter & Jelly always reminds me of the beginning of a new school year, being tucked into lunchboxes for kids. 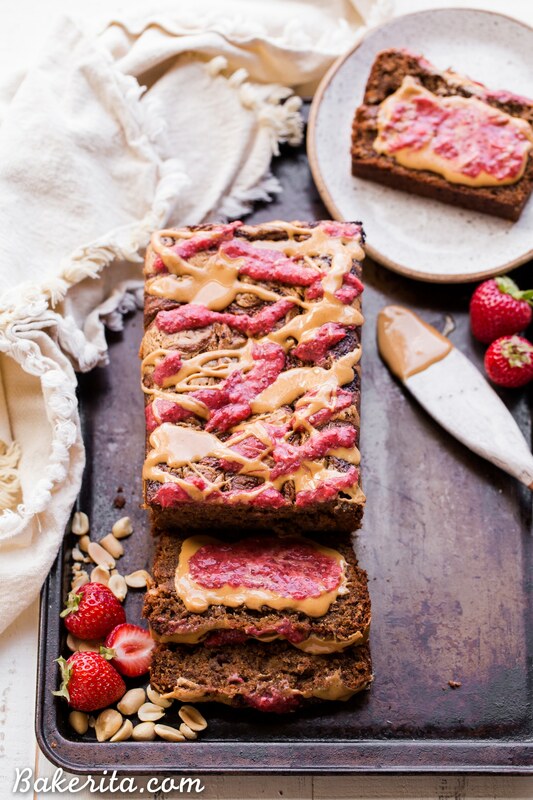 I like to think PB&J has a place all year round though, and this peanut butter & jelly banana bread proves that it does. Despite the name, I’m a jam > jelly kind of person. How about you? Jam is just more real. Give me all the chunks of real fruit instead of a sugary fruit-flavored gel. That’s why I choose to make my own jam for this bread (and to use on the regular whenever life calls for jam). It couldn’t be simpler: just strawberries (or your fruit of choice) and chia seeds. I don’t even add sweetener, because strawberries are sweet enough on their own. You can add a tablespoon or two or maple syrup or honey if you want, but I don’t find it necessary for my tastes. 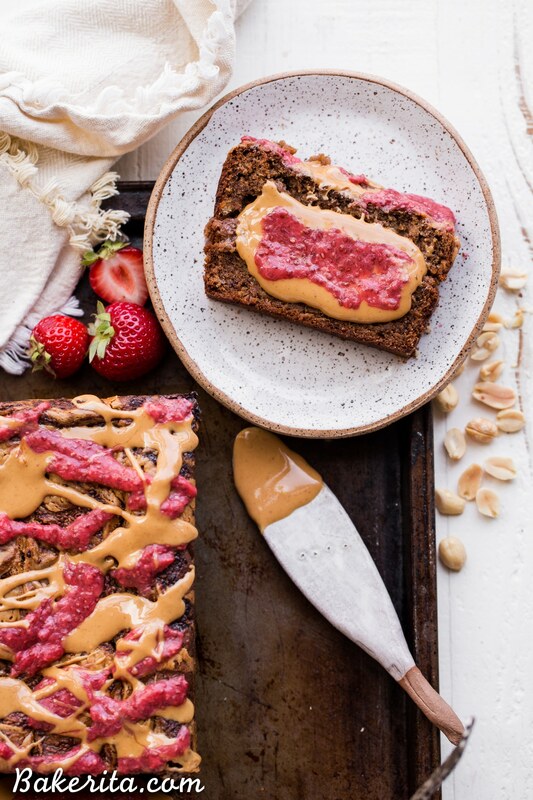 With that homemade strawberry chia jam, you can make this incredible peanut butter & jelly banana bread. The jam is swirled in the middle of the bread, along with some creamy peanut butter, and even more swirled on top of the loaf to add extra fruity flavor. The banana bread itself is also scrumptious. It’s gluten-free and vegan while staying so fluffy and tender, thanks to all the bananas. Peanut butter is also mixed into the batter, adding flavor and helping create a luscious texture. I like to slice this bread after it’s cooled and keep it in the fridge or freezer to eat as a snack when I need a little something-something. It’s even MORE delicious topped with a little more peanut butter, but it’s also delicious as is – especially warmed up a bit. 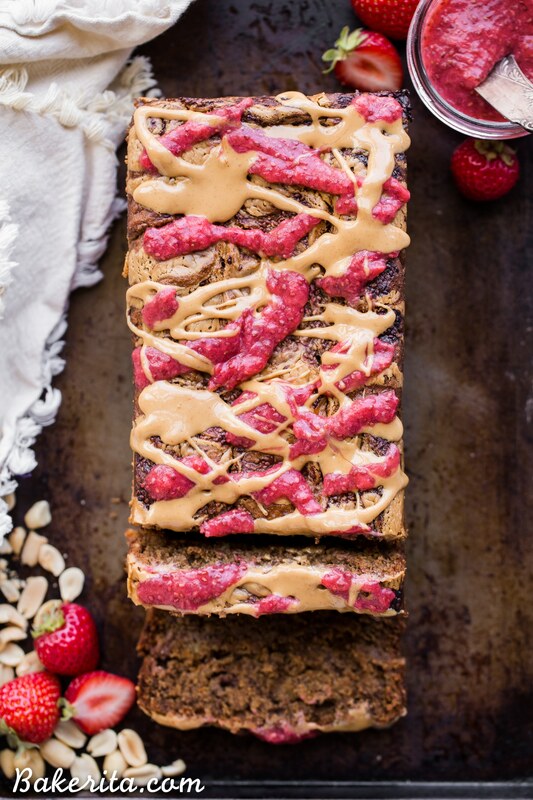 This Peanut Butter & Jelly Banana Bread will remind you of a PB&J, but in soft & sweet banana bread form. 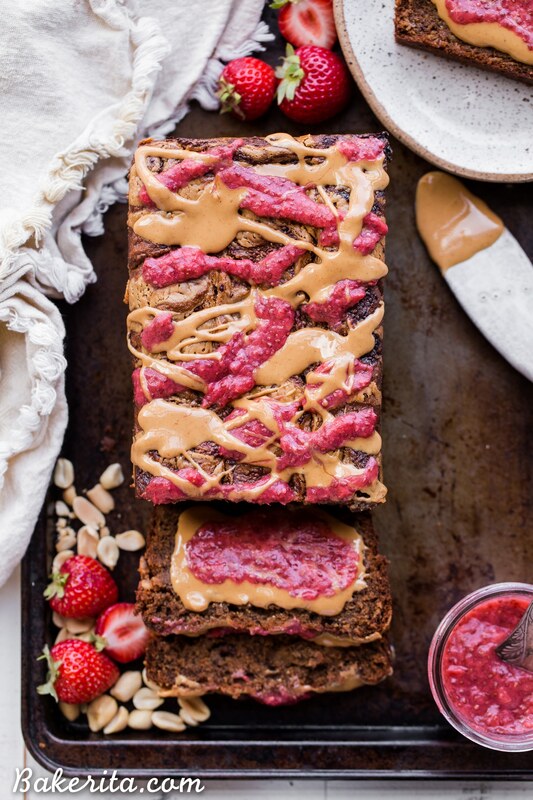 This recipe is gluten-free, vegan, and layered with homemade strawberry chia jam and creamy peanut butter. Preheat oven to 350°F. Grease a 8.5” x 4.5" loaf pan (you can also use a 9x5” pan) with coconut oil and/or line with parchment paper. Place bananas in a large mixing bowl. Use a potato masher or fork to mash them well. Add almond milk, coconut sugar, peanut butter, coconut oil, flax meal, and vanilla extract, stirring to combine. Add oat flour, almond flour, baking soda, baking powder, cinnamon, and salt. Stir until combined. Pour half into loaf pan. Add a layer of the strawberry jam on top, about half of it. Drizzle 2 tablespoons of peanut butter on top too. Lightly swirl in with a knife. Layer the rest of the batter on top and top with the remaining jam and peanut butter, swirling it on top. Bake for 50 minutes to an hour, or until a knife comes out clean. If your loaf looks like it's getting too brown, tent with tin foil on top after 40 minutes. If you’re using a 9x5” pan, check on the banana bread after 40-45 minutes. Dice the berries, if you're using fresh berries. Place the diced berries in a small bowl. Microwave for one minute. If you're using frozen berries, cover and microwave them whole for 2 minutes and then mash the berries up. Stir in the chia seeds. Microwave for one more minute, and then let cool slightly before using. Hi Carol, I’ll add the info to this recipe but you can always calculate via a site like myfitnesspal.com to find out the nutritional info. Could you use all almond flour or rice flour instead of oat flour? I don’t really use rice flour so not sure how it would perform here. I think all almond flour would work, but it might be a little bit heavy/denser. Haha, it’s hard not to! Thanks, Elizabeth. Hey Rachel…! This sound sooo yummy and looks extra amazing, am so glad to read your post and i will try to making this in upcoming few days…..Thanks for sharing & keep shared your new delicious recipes…..! Hi Rachel, I made this recipe because I had some over ripe bananas that I didn’t want to throw away and……..all I can say is I don’t know how I had enough self control to limit myself to just a slice and not gobble down the whole loaf right then and there. Seriously, this takes banana bread to a whole new level. The saltiness of the peanut butter combined with the tartness of the strawberry jam and the sweetness of the banana is just so flippin’ good, I can’t get over it. The only thing I swapped out was the almond flour because I can’t have almonds, so I just used regular GF baking flour instead. Thanks for sharing this recipe with us, Rachel. I am going to make it again FOR SURE. Thank you so much for your sweet comment, Kate! So thrilled you’re loving it, and thanks for sharing that your GF flour swap worked out well. Thank you for sharing this recipe! Just looking at the pictures makes my mouth water. I’m not a huge fan of peanut butter and was wondering if using homemade almond butter as a substitute would work instead. Let me know what your thoughts are! Hi Maya, yup that should be totally fine! You could likely use any nut butter here. Enjoy!